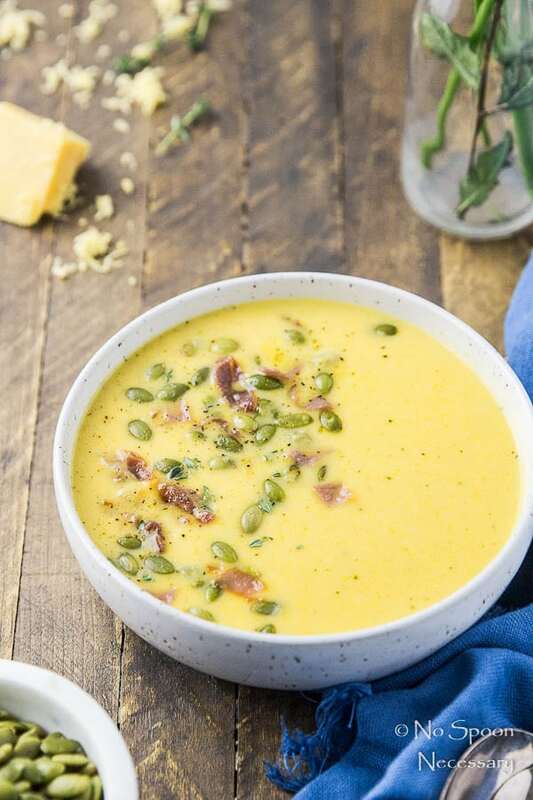 Creamy, velvety, smooth soup with notes of fruity apples, cheesy cheddar, and sweet hard cider; topped with salty, crispy prosciutto and crunchy pumpkin seeds. 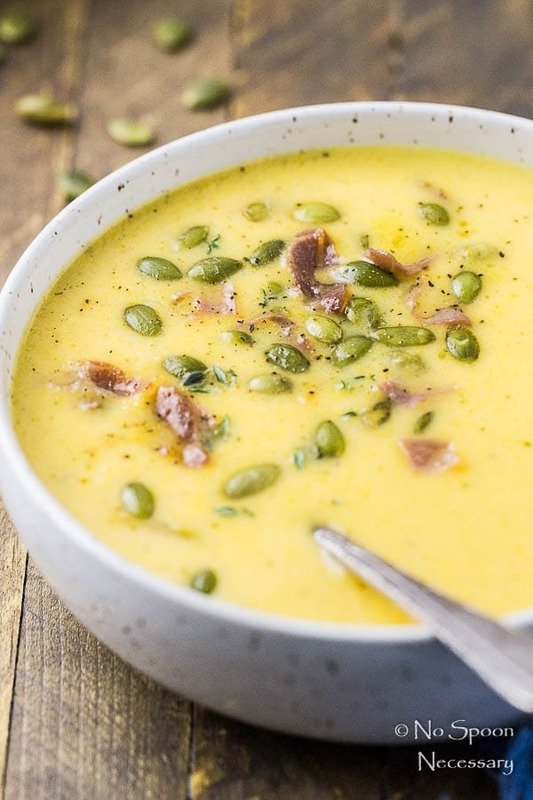 This Cheddar Apple Cider Soup is festive, comforting and the perfect way to start your Thanksgiving dinner! Hi-ya, friends! How was your weekend? Did you get out and enjoy yourself? Or did you stay in the cozy confines of your casa and get your relaxation on? Boy had a work thing out of town, so I had the house mostly to myself for the weekend. It was parrrrr-taaay central for Dolce and I up in the SuBourbon Country Cottage. We indulged in some guilty pleasure reality TV and tested out a few recipes in the kitchen. I know that may not seem like a party to a lot of you, but anything involving pajamas and staying home is MY type of revelry. Anyways, question – have you started planning your Thanksgiving yet? Are you a procrastinator? Like, talk to you on November 22nd and you MIGHT have the menu finalized. Or are you a super organized individual? And your brain is already in full throttle holiday mode. World watch out, you could do Thanksgiving tomorrow if the opportunity arose. Well, regardless of what camp you fall into, some fabulous food blogger friends and I are throwing a virtual Thanksgiving party today. Wahoo! From the appetizer to dessert, we have you COVERED. So bust out your comfiest threads and let’s get our Thanksgiving meal planning on. Starting with my portion of the meal – Soup! 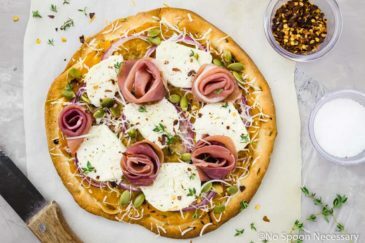 …with Crispy Prosciutto and Pumpkin Seeds! THIS soup! I feel like this soup needs no explanation, because Apple + Cheddar + HARD Cider = ALL the cozy soup feels. But I’ll indulge you. And by that I mean I’ll ramble on about how this apple soup recipe is straight up slurp-tastic deliciousness for your SOUL. Creamy, smooth, velvety soup with notes of fruity apples; rich, subtly cheesy cheddar, and sweet, barely boozy hard cider. 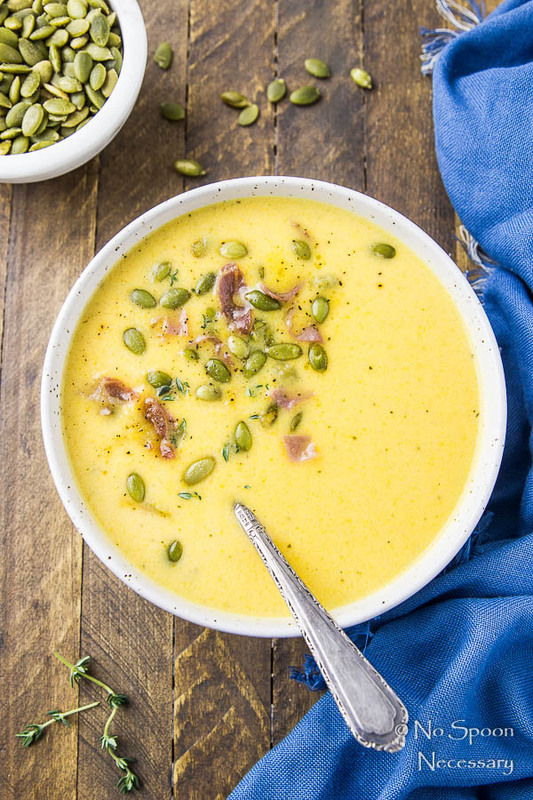 Topped with crispy, salty prosciutto and crunchy, seasonal pumpkin seeds, this soup is like a warm hug on the coldest of days. On top of ALL that festive fabulousness for your taste buds, this soup couldn’t be any easier to whip together. Melt some butter and sauté the vegetables. Add the flour, and then the stock, cider and cream. Simmer for a beat and then blend it all together. Stir in a splash of brandy (YES BRANDY!!) and the cheese. While all of that is doing its magical soup marrying thing, crisp some prosciutto in a small skillet. 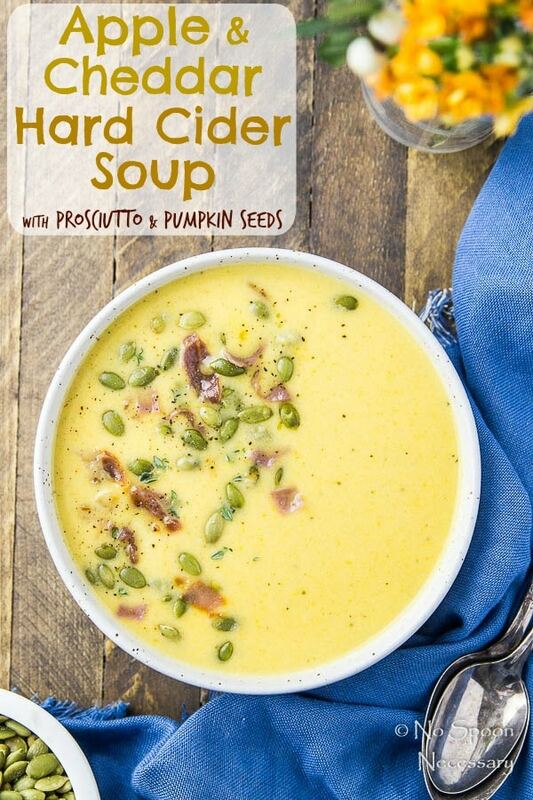 Then ladle the soup into bowls, top with crispy prosciutto, sprinkle with pumpkin seeds and SERVE. Apple Cheddar Hard Cider Soup’s on! Can you freeze apple soup? Yes! 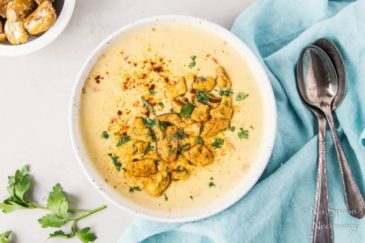 You can absolutely freeze this cheddar apple soup! 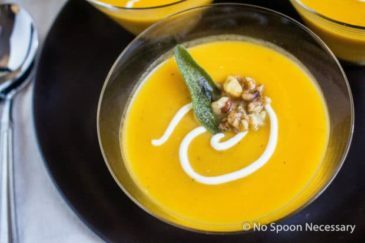 In fact, I highly recommend making a big batch of this soup and freezing it into convenient grab-and-go meals for those busy hectic work nights! Freezing apple soup is easy. Simply follow the recipe as directed, omitting the garnishes, and then allow the soup to cool completely. 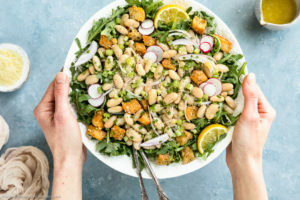 Once cool, transfer the soup to freezer-safe bags or containers, making sure to leave an 1 inch or more of space at the top to accommodate for expansion. The soup can safely be frozen for up to 3 months. 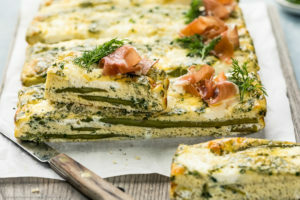 When ready to use, thaw in the refrigerator overnight and then heat through in a saucepan, stirring occasionally, and adding a bit of stock if necessary. I used golden delicious apples in my apple soup, because I love their subtle sweetness, but use whatever apple variety is your favorite. The tartness of a Granny Smith would taste excellent in here if you are looking for a soup that is a little less sweet. I like to peel and chop my apples in advance to save prep time later (especially at Thanksgiving). To prevent apples from turning brown mix 1 teaspoon of kosher salt with 2 cups of water and store your chopped apples in the salt water (covered and refrigerated). Before using them simply rinse and drain. You can easily double the salt water mixture if needed. I used heavy cream in this soup, but if you would like to substitute half-and-half feel free. However, your soup will be on the thinner side. Make sure you taste the soup and adjust for seasoning with salt and pepper before serving. Cream based soups require a good amount of salt to really make the flavors sing, so don’t be scared to generously salt! 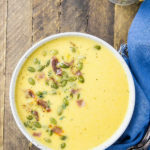 Cozy, creamy-dreamy and a cinch to whip together, this Cheddar Apple Cider Soup NEEDS to be on your Thanksgiving table! Until Thursday friends, cheers – to cider spiked soup! 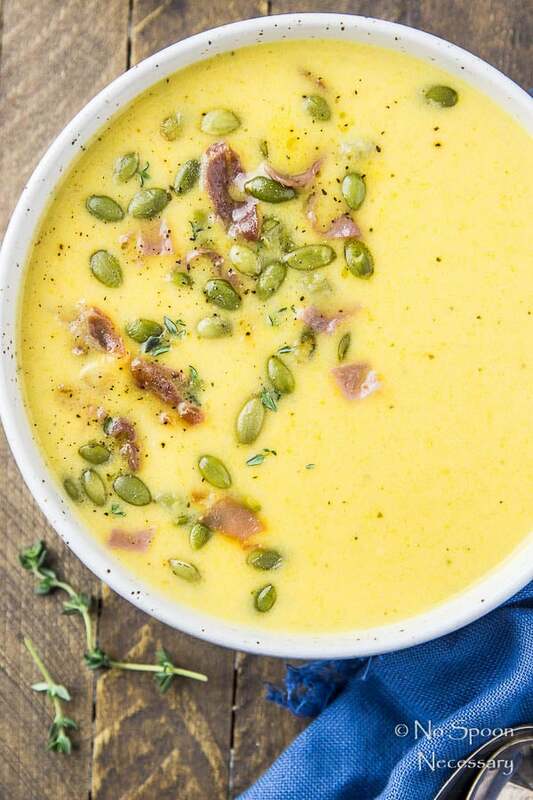 Creamy, velvety, smooth soup with notes of fruity apples, cheesy cheddar, and sweet hard cider; topped with salty, crispy prosciutto and crunchy pumpkin seeds. 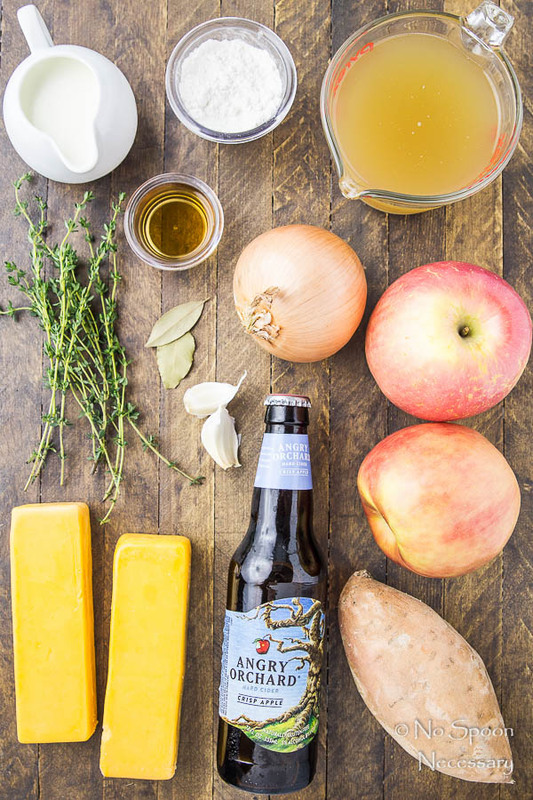 This Apple & Cheddar Hard Cider soup is festive, comforting and the perfect way to start your Thanksgiving dinner! For the soup: Melt butter in a large soup pot over medium-high heat. Add the potatoes and season with 1 tsp salt and ¼ tsp pepper. Cook, stirring occasionally, for 3 minutes. Add in the onions and apples. Cook, stirring frequently until the vegetables are softened, about 8-10 minutes. Add in the garlic and cook until fragrant, about 30 seconds. Sprinkle the flour over the vegetables and cook, stirring constantly, until the flour is incorporated. Slowly add the stock, cider, half-and-half, thyme and bay leaves, stirring constantly. Increase heat and bring to a boil. 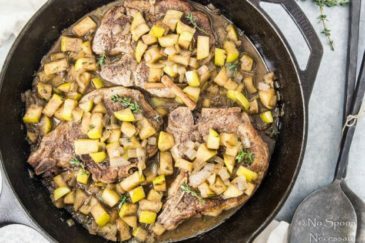 Reduce heat to low and simmer for 10-12 minutes or until apples are tender. Remove bay leaves and discard. Stir in the brandy. Add the cheese, one handful at a time, stirring constantly until cheese is melted and smooth. Taste and adjust for seasoning with salt and pepper. Keep warm until ready to serve. Meanwhile, crisp the prosciutto: In a small skillet, heat 1 tablespoon of olive oil. Add the prosciutto and cook over medium-high heat, tossing, until crisp, about 30 seconds – 1 minute. Using a slotted spoon, transfer the prosciutto to a paper towel–lined plate to drain. 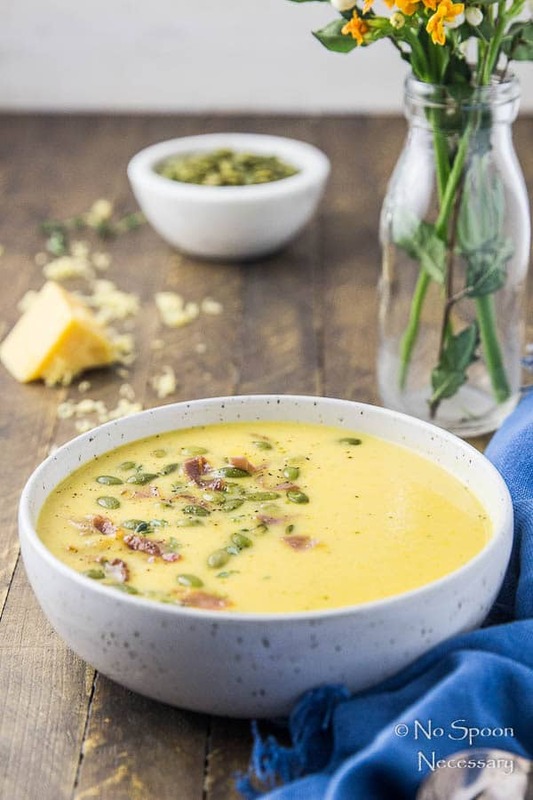 To serve: Ladle soup into serving bowls and top with crispy prosciutto and pumpkin seeds. Enjoy! 1. I used golden delicious apples in my soup, because I love their subtle sweetness, but use whatever apple variety is your favorite. The tartness of a Granny Smith would taste excellent in here if you are looking for a soup that is a little less sweet. 2. I like to peel and chop my apples in advance to save prep time later (especially at Thanksgiving). To prevent apples from turning brown mix 1 teaspoon of kosher salt with 2 cups of water and store your chopped apples in the salt water (covered and refrigerated). Before using them simply rinse and drain. You can easily double the salt water mixture if needed. 3. 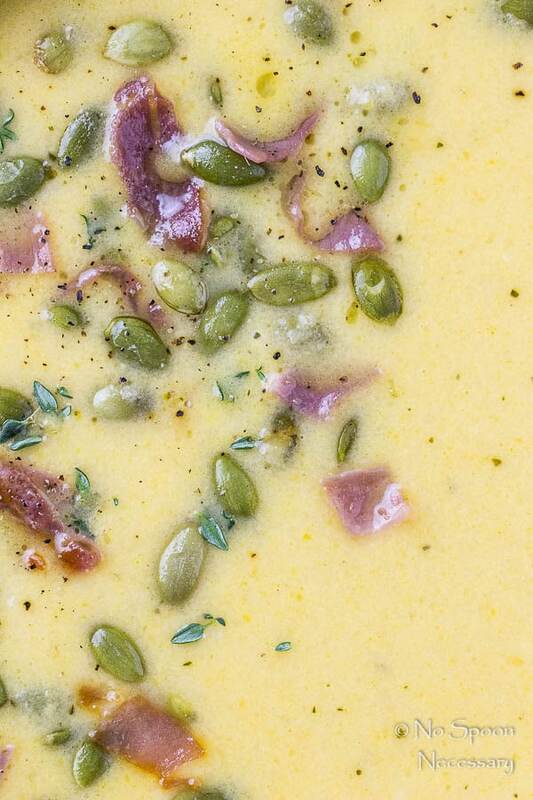 I used heavy cream in this soup, but if you would like to substitute half-and-half feel free. However, your soup will be on the thinner side. 4. Make sure you taste the soup and adjust for seasoning with salt and pepper before serving. Cream based soups require a good amount of salt to really make the flavors sing, so don’t be scared to generously salt! **Nutritional Information does not include optional garnishes. What is not to love about this soup, it has everything going for it, Cheyenne. What an intriguing soup! 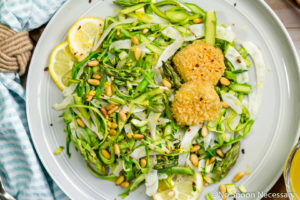 I love how you added some crunch to it! This soup looks so gorgeous. Thank you so much for sharing! Your weekend sounded perfect to me! Gotta love those lazy weekends especially if I can have a big bowl of this yummy soup! 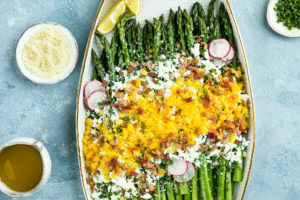 Love the apple cheddar combo! 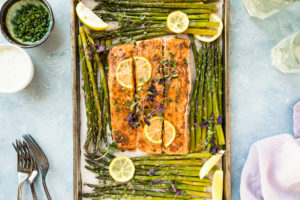 Such a perfect addition to everything else in the Thanksgiving party! Crispy prosciutto is my liiiiife. This soup is so vibrant and pretty Cheyanne, I love it! PS I’m a procrastinator. 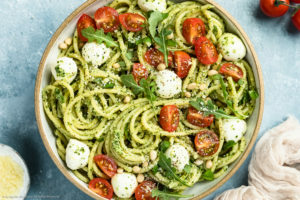 Bad food blogger! Bad!